Piktochart is a cloud-based application that allows users to easily create infographics. Users can embed interactive maps, charts, videos and hyperlinks in a Piktochart infographic. To create an infographic, you start by choosing a blank or pre-designed template, or theme, and then add information. Piktochart provides a library of icons, images, fonts, and other design tools. Icons and images are organized by subject, including education, entertainment, people, and shapes. Once completed, each infographic can be saved for future editing, and the finished product can be exported as a PNG, JPEG, or PDF file. Price ★★★✩✩ Free version that offers 3 themes. Type of learning Constructivism; Connectivism Analyzing infographics fosters reflective practice and enable context and content-dependent knowledge construction for students. Ease of Use ★★★★✩ Piktochart is easy to navigate, provides templates for beginners, and offers online support. Privacy ★★★✩✩ Personal Identifiable Information is shared with Piktochart team. It also collect user information related to pageviews, hours spent , traffic source, browser type, location, and IP address and only share it with 3rd party analytics tools – Intercom, Kissmetrics and Google Analytics. Accessibility ★★✩✩✩ Font and colors can be customized . Infographics may well not be accessible to learners with low vision or color blind users. Piktochart App for Ipad has all essential features (doesn’t have advance ones). Class Size Unlimited Each account registered is by one person with their personal email. ISTE Standards for Students Innovate designer, Creative communicator, Empowered Learner. Use of technology to take an active role in choosing, achieving and demonstrating competency in their learning goals.Students select and use digital tools (brainstorming tools for ideas, Piktochart for designing) to plan and manage a design process that considers design constraints and calculated risks. Power and Bias ★★★✩✩ Tool is only available for English Speakers . The upgraded version of Piktochart provides more than 10 ways of visualizing data from the most basic dot, line, bar charts to more multifaceted types, such as gauge and donut charts. The upgraded version of Piktochart also allows users to create interactive Piktocharts that can be embedded into websites. When saving in HTML, you will also see a nice hover effect to display the numbers over the chart and will be able to remove the watermark on your final product that comes on the free version. Piktochart allows multiple representations of information and real world data. It gives students an alternative way to demonstrate their knowledge, while also showcasing their design skills (For example: Instead of writing an essay on the topic, Piktochart can be used to design a visual on that topic). Teachers can also use Piktochart to create infographics to provide an alternative way for students to access content knowledge (e.g., other than a lecture or reading from a textbook). Since Piktochart infographics are available online, students can access teacher-designed infographics before class to prepare their thoughts or after class to enrich their learning. Teachers can balance teamwork and individual work based on the students learning profiles. Substitution: Students design an infographic on Piktochart rather than on paper. 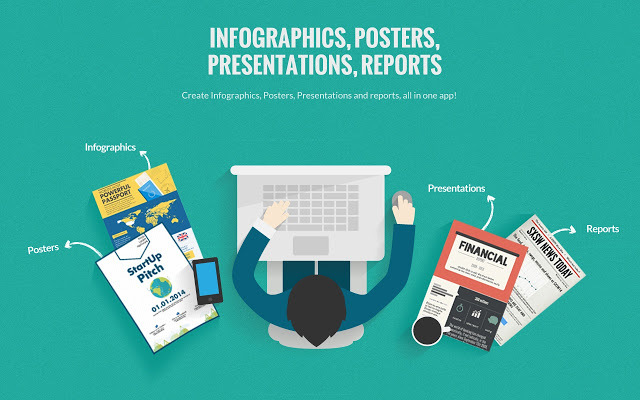 Augmentation: Students can easily share their infographics with a broader community. Modification: Students and teachers can create interactive, multimodal images that incorporate videos, maps, text, links, and graphics. Redefinition: Infographics can be displayed locally or shared internationally to extend conversations and discussions globally. Is there a skill that you are going to be teaching multiple times throughout the year? For science this could be how to write an effective scientific conclusion. For english this could be how to annotate and summarize a piece of text. For social students it could be mastering data based questions with 5 paragraph essays. For math it could be how to graph a line and write an equation. If you know this skill will be repeatedly taught or referred to, teachers can use Piktochart to make a graphic for the students. They can keep a copy in their notebook or iPad and refer back to it when they get stuck on a missing step. Create a Bedazzled Syllabus. You can also explain your Grading System and/or Rubrics in exciting ways using Piktochart. Make an interactive and informative document about the do’s and don’t of technology and social media or any other rules in the classroom. You can also have the students do a scavenger hunt with the document to locate the most important information. Teachers could use Piktochart to enhance instruction is through creating infographics in presentation mode. Instead of using Powerpoint slides or Prezi, teachers can create infographics on Piktochart that teaches the necessary content. The infographic can be projected for the class to view in presentation as a whole group or on their own device. Math: This exercise drives home the point that not all forms of visualization are appropriate in any given situation. Can you present a map as a scatter plot? Representational images as a line graph? A pie chart as a diagram To help students understand that different visualization strategies are appropriate for different data and different situations, you could have them extract data (numbers) from one infographic, and then present that same data in a different form. For example, they could take the numbers from a bar graph and try to present it as a pie chart. Science: Create Digital posters in Sociology class, that would be culturally relevant and reflect the diverse background of students in the class. For example: creating posters of African-American scientists that were innovative and contributed things that we still use today. Geography: Students use infographics to understand how a place, population or culture changes over time. Students might create their own maps that offer a “before and after” view of a place, using two or more maps, other documents or historical photographs. Government and Civics: Students fact-check and annotate an infographic about government policy or politics.Or, students can use or create infographics to test classmates’ knowledge of historical facts in creative ways like having them identify American presidents and first ladies by hairstyle alone. Physical Science: Students use existing or original infographics to explain a process to the class. For example, those working with the aftermath of the earthquake and tsunami in Japan might use “Assessing the Radiation Danger, Near and Far “ and “Hazards of Storing Spent Fuel” preparing a presentation that incorporates other research and scientific principles as they walk the class through their infographics. Or, use an infographic to illustrate principles of physics. “How Mariano Rivera Dominates Hitters” for example, demonstrates spin, lateral movement and the pressure exerted on a baseball. Language Class: For example, in Spanish, students study the food and culture of a Spanish-speaking country. The assignment for them could be to research and then complete a brief report using Piktochart. This format enables students to complete their whole project using one tool. Within the tool, they have many choices regarding how they will enhance their work. Whether it’s choosing between templates or deciding which artistic object to include, these options are all laid out for the student. It’s durable and accessible to anyone at any time, and can easily be added into a digital portfolio. Literature: Students use Piktochart to make a timeline of their own reading history. English classes could use Piktochart to diagram a book’s plot or character sketches. Technology: What are some important trends in technology? Students use infographics to explore topics like Technological evolution, Password security and Twitter trends , among others, then create infographics on the topics of their choice, based on their own or available research. Critiquing and Collaborative reasoning: Have student start by just thinking about what they like and dislike about an infographic. Have them study existing infographics from various sources and work together as a class to highlight key patterns that seem to have meaning in the real world. Talk about the difference between an infographic and a poster where information is scattered and unrelated.It would be best if you give them a rubric, a criteria or list of how they would judge the infographic. Black, M. (2016). Piktochart. The Charleston Advisor, 18(2), 45-47. Chandler, M. (2016). Piktochart: Basic Designs for Beginning Designers. Lexia: Undergraduate Journal in Writing, Rhetoric & Technical Communication, 4(1), 9. Ellis-Barrett, L. (2016). Piktochart. School Librarian, 64(1), 20-21. Gallant, K., Lorang, E., & Ramirez, A. (2014). Tools for the digital humanities: a librarian’s guide. Leaman, H., DiLucchio, C., & Fisher, M. (2016, March). Use of Piktochart to Enhance Teacher Action Research. In Society for Information Technology & Teacher Education International Conference (Vol. 2016, No. 1, pp. 2155-2155).